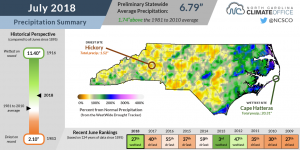 The latest climate summary for North Carolina covering July 2018 is now available at http://climate.ncsu.edu/climateblog?id=262&h=5666e5c1. 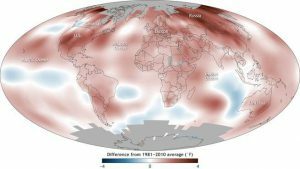 Posted in Climate and Ag in the news, Climate summaries, Sources of weather and climate data, Tools for climate and agriculture. 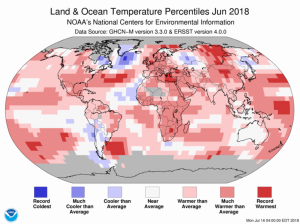 July 2018 brought welcome near-average temperatures to the State of Georgia, with most stations experiencing temperatures that were within a degree of normal values. 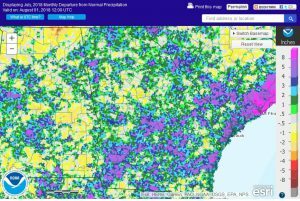 Rainfall in many parts of the state was above normal, but dry conditions were scattered across the state in the hit-or-miss thunderstorms that fell throughout July…. 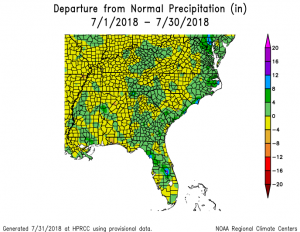 The latest monthly climate summary from Florida is now available. 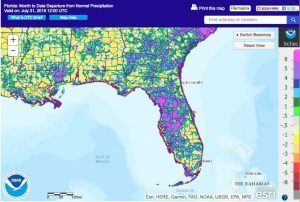 You can find it at https://climatecenter.fsu.edu/products-services/summaries?id=526.